Do you want to greatly enhance your vehicle’s stereo systems? If so, you’ll have plenty of options at your disposal. Today, technology can give you the ability to improve your stereo system with efficiency and cost-effectiveness. This is why you should consider investing in an Android car radio. This device will provide you with far more options than ever before. With an Android radio for your car, you’ll be able to listen to Spotify, Pandora and even Amazon Music. Within this guide, you’ll find information that can help guide you to the best Android head unit on the market. Finding an excellent Android head unit can be far more difficult than you could ever imagine. Nevertheless, there are some key factors that can to make your decision much easier. For your consideration, these factors will be explored in greater depth below. Android radios are very high-tech. They’re capable of storing music directly to an internal storage bank. The number of songs you’re able to store to the radio will depend on the amount of space provided. In order to guarantee that you make the right choice for your money, you’ll need to ensure your radio can hold the precise number of songs you intend to download. Some units are also equipped with a SD card slot. This can help to increase the space provided. While you’re at it, you should contemplate whether or not you want to be able to listen to the conventional AM/FM radio. From time to time, you may need to get an update of the weather or the traffic in your area. In this type of situation, the regular radio can be very handy. The good news is that many Android radios are also capable of picking up these radio frequencies. Ensuring your radio has this capability is highly recommended. Another thing to remember is that some Android car radio systems are actually capable of accessing the Internet. This is definitely a great feature. It gives you the ability to check the weather and get news updates within a short period of time. If you want to be able to access the Internet from your Android radio, you’ll definitely want to choose one that is Wi-Fi enabled. Some of these devices are actually equipped with GPS technology. A GPS navigation systems can come in very handy when you find yourself lost in an unknown area. Adding GPS compatibility to your Android head unit is definitely a good idea, especially if you travel frequently. With a GPS-enabled Android radio, you’ll never have to worry about getting lost. Taking your hands off of the steering wheel to adjust the radio can be incredibly dangerous. This could lead to a crash and life-threatening injuries. It is best to keep your eyes on the road, while controlling your radio with your voice. If you want maximum safety and peace of mind, you should definitely consider investing in an Android car radio that is equipped with voice control features. You spend a tremendous amount of time in your vehicle driving from location to location everyday. You probably enjoy the convenience of listening to the radio and catching your favorite songs on your way home from work. However, if you truly want to take your car audio experience to the next level, you need to check out this new and innovative touchscreen entertainment system. 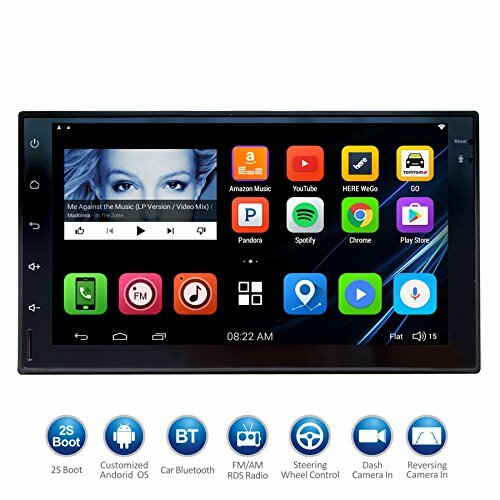 Created and designed to operate just like an Android operating system the ATOTO M4 is in a class of its own, allowing drivers to quickly and easily upgrade key software functions like the navigation system. Latest update: This advertisement/listing is now using selling used/refurbished ATOTO A62710P! So you will receive the used A6, instead of old / previous M4 M4171. Keep Original Steering Wheel Key Control functioning (based on resistance anolog signal input only; write to us if you have questions), Users are allowed to re-define & rebuild matching of steering wheel key with system function response. Google Voice command app is customized as a built in option for quick access. Don’t you just hate it when your phone rings while you are in your vehicle, and you have to search through your purse, or dig through your pockets to pull out your phone? Not only is this quite a hassle, but it is dangerous as well. However, with the ATOTO M4 this is something that you never have to worry about thanks to the special Bluetooth chip installed inside the motherboard. Once your smartphone is paired with the motherboard, you can answer or make calls right from the innovative console. Along with this, your contact list and recent phone calls will also be transferred right to the screen. Sometimes large touchscreens can be a problem in vehicles, because they are constantly exposed to the elements of the weather. However, the ATOTO M4 utilizes a special type of touchscreen glass that is explosion-proofed, which will prevent that glass from breaking or rupturing, regardless of how much heat or cold weather it is exposed to. Do not let the specially designed glass fool you, because the touchscreen is very responsive and makes it easier than ever for users to scroll and navigate through customizable options. With built in Wi-Fi and over 300 different applications to choose from users will truly never get bored or run out of customizations with this audio system. With the tremendous amount of time that you spend in your vehicle, you want to make your ride as enjoyable and convenient as possible. Now, you truly can do that and so much more with the ATOTO M4. If you are a music enthusiast that does a lot of traveling, you will need to invest in a high-quality car stereo system, like the EinCar Navigation Player. This unit features all the bells and whistles, plus it has been upgraded to include a rear-view camera. There is no doubt that for the price of the EinCar Double 2 SIN Navigation Car Stereo that you will be entertained throughout your trip, whether you are driving two miles or 1,000. OS: Latest Android 6.0 Marshmallow system,Quad Core Processor,16GB ROM,1GB DDR3;7 Inch widescreen with Capacitive Multi-Touch Screen,800x480 Resolution; Built-in Microphone and External Microphone is included! The EinCar Stereo is designed to play music and videos, which is perfect if you have a travel partner or like to make frequent rest stops. The embedded USB port will allow you to connect your tablet, mobile phone or laptop up to the stereo, so you can watch the movies stored on the device. The same goes for playing music, just connect the USB cable from the associated device to the stereo and listen to your music list. The Bluetooth radio embedded into the EinCar Stereo will provide you with the same capabilities as the USB port. The only difference is it can be done in a wireless manner. You will not need to be bothered with connecting any cables, which are always a hassle or safety issue, just to listen to your favorite tunes or watch movies. In fact, all you need is a compatible mobile device, such as a tablet, smartphone, iPod or laptop. As long as the device is within 33-feet of the stereo system, which should be anywhere inside the vehicle, you will be able to steam your stored media. The built-in microphone will allow the driver or anyone in the vehicle make and accept calls in a hands-free manner. This small feature will allow you to focus all of your attention on the road, while decreasing the risks of a motor vehicle accident. Enjoy talking to your family and friends, while driving without all the risks. For the price, you will not beat the EinCar 6.2” Double 2 DIN Car Stereo. It is embedded with all the necessities to improve your traveling experience, as well as the passengers. The 6.2” touchscreen is extremely easy to navigate, allowing you to make adjustments and create new settings with a touch of the finger. If you’re looking for a great Android radio and want to spend a little more, you should definitely consider investing in the JOYING 7. This specific unit offers additional functionality and specifications that can help to make it worth the investment. The unit includes 32GB of Flash memory and 2G Ram. With this combination, you can guarantee that this stereo will work at lightning fast speeds. At the same time, you should know that this device is Wi-Fi enabled. Truly, there isn’t much you cannot do with the JOYING 7. Additional details will be provided below. One of the best things about the JOYING 7 radio is the fact that it contains 32GB of internal storage. This will be plenty for the average individual. With 32GB of memory, you’ll easily be able to store hundreds of songs to the system. This will give you the ability to leave your SD card and MP3 player at home. Another excellent aspect of the JOYING is the FM/AM radio support. With this specific unit, you’ll be able to access and listen to all of your favorite conventional radio stations. At the same time, you can actually rename the stations to suit your unique needs. The possibilities are endless. The unit also offers multi-languages, online weather forecasts, and steering wheel control. If you travel frequently, you’ll be happy to know that this unit is GPS compatible. It supports an assortment of GPS systems, as well as online and offline maps. The unit is Wi-Fi enabled and can connect to any local hotspot. Once you’ve added this unit to your automobile, you’ll never have to worry about getting lost ever again. It’ll give you to your destination with total accuracy. 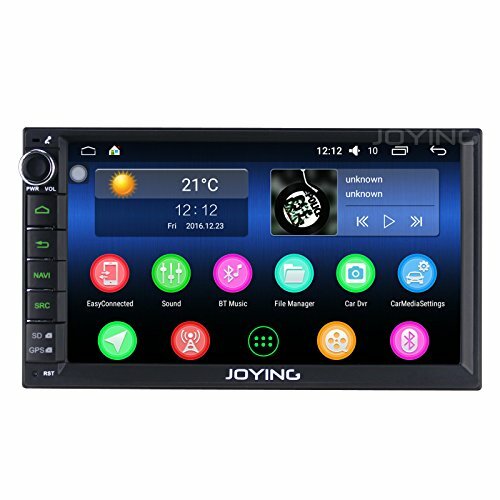 At the end of the day, the JOYING 7 Double DIN Touch Screen Radio is great. It is sleek, versatile, and Bluetooth enabled. It is a little costlier, but the price is easily justifiable. If you want the best of the best and can spend a little extra, the JOYING 7 is well worth checking out. This Android Double DIN Radio is definitely impressive in the most important categories. It is moderately inexpensive, yet the device possesses the same features you would expect from a much costlier model. The beautiful 6.2” resistive touch panel display will give you complete control over your stereo system, while also allowing you to switch from one media type to the next. The unit is compatible with the JVC Music Play App, which will give you the ability to search through your audio files by Artist, Genre and Song. The device is also multilingual. In total, you’ll be able to choose between seventeen different languages. Additional features will be explored in depth below. There is a possibility that you have a lot of music stored on your iPhone or Android phone. 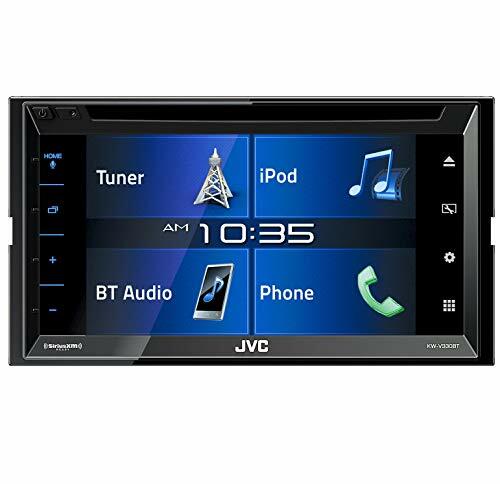 If so and you want to be able to play that music in your car, the JVC KW-V130BT Radio will give you the ability to do so conveniently. This radio is equipped with a USB port. This enhances the functionality of your radio, while also giving you more freedom to access a wider assortment of music. Another great thing about the JVC KW-V130BT Radio is the fact that it is equipped with a tuner. 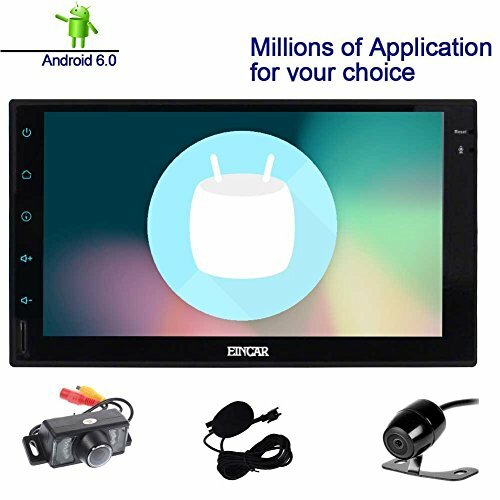 If you’re looking for the very best Android car stereo, you will definitely want one that can pick up local radio stations. This is one thing that the JVC KW-V130BT does and it does it exceptionally well. This device will make it possible to listen to your music as MP3, WAV, AAC, and even MPEG files. However, you’ll still be able to switch over to the traditional radio whenever you wish. One of the best things about this specific Android radio is the Bluetooth compatibility. If you want to be able to connect your devices to the radio without any wires, you’ll be able to do with this specific unit. It is compatible with a wide assortment of Bluetooth-enabled devices. At the end of the day, the JVC KW-V130VT Android Radio is very impressive. In fact, it is truly capable of doing it all. It’ll give you the ability to listen to Spotify, Pandora, iHeartRadio, and even SiriusXM. Plus, it still has a radio tuner. If you want maximum versatility and flexibility, you’ll definitely want to consider investing in this unit. You’ll love it! All in all, there are plenty of excellent Android radios on the market. Nevertheless, only one will be suitable for your unique needs. Be sure to take the time to familiarize yourself with the devices above. Once you have, you’ll have little to no trouble choosing the device that is right for your budget and listening preferences.